Coming home to the welcoming aroma of a steaming pot of richly flavored soup or stew has to be one of the most comforting experiences of the season. Winter’s short days and dreary weather leave our bodies craving warmth. Gently simmered soups and stews from Germany are the perfect winter comfort food. One pot dishes are usually quite simple and fun to prepare and provide great nourishment for the body and comfort to the mind. From a nutritional standpoint, most soups and stews have a balance of protein (meat) and healthy carbohydrates (potatoes, pasta), vitamins (vegetables) and minerals (stock/broth) that’s hard to beat. 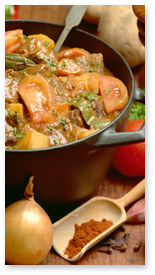 Another great thing about stews, especially, is that they usually taste even better the next day. So make sure to prepare enough to last.